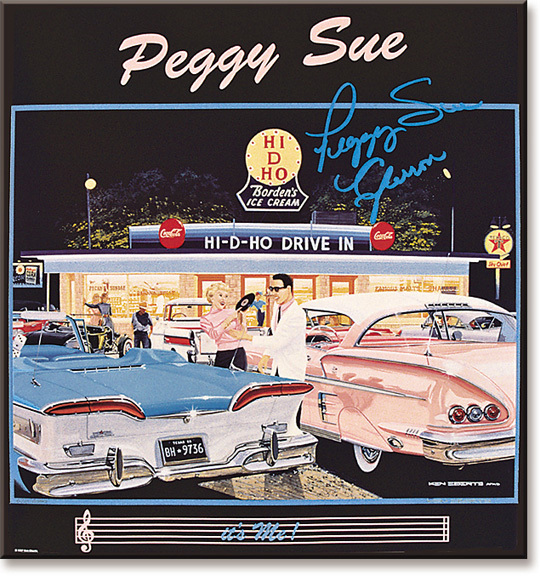 Limited edition poster signed by the artist and the late Peggy Sue Gerron. This unique artwork features the actual girl for whom Buddy Holly's famous record is named. The 1957 hit song was written by Holly and drummer Jerry Allison about their high school friend Peggy Sue, who eventually became Jerry's wife. The scene portrays the singer's Chevy Impala at a drive-in frequented by Peggy Sue, Buddy Holly and the Crickets in their home town of Lubbock, Texas. 1958 Chevrolet Impala, 1958 Edsel Citation convertible and others.